I am a newbie of CDS view related topic and recently I have to learn it. I will write down here not only the knowledge I learned but also the way how I obtain them via self study ( debugging, or other ABAP tool ). Because it would be quite easy for us to just paste the source code of sample CDS view from other guy’s blog and activate it. The CDS view works. But what have you learned from this simple Ctrl+c and Ctrl+v? 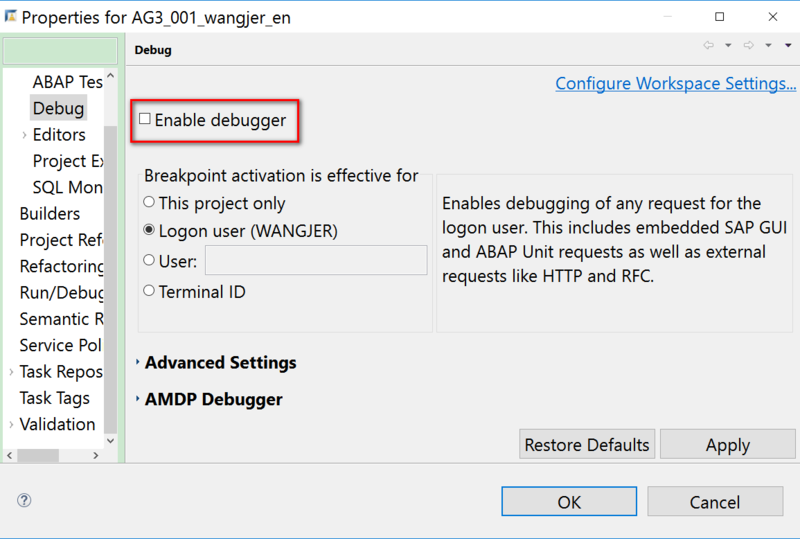 For me, I always get used to dig a little bit deeper such as “what has happened in the backend after I click the activate button in ABAP development studio? “. In this part, I will introduce how to test the OData service generated based on my CDS view via Chrome extension – postman. Generate runtime artifacts and register the odata service via tcode /IWFND/MAINT_SERVICE. Now the odata service is ready for testing. Of course you can use SAP gateway client to test, however I prefer Chrome extension, postman, which can organize all my test cases in a hierarchical structure like below. You have several ways to get the url to test metadata retrieve operation. In tcode SEGW, you can get your service name. Change the url as “/sap/opu/odata/sap/<Your service name>/?$metadata”, and then trigger request. You should see 200 return code with status OK.
Or you can also use Postman, in this case you have to paste the absolute url with host name and port number, both of which could be found in gateway client response, as marked by the black rectangle above. The name “Zjerrytest20160310” is the entitySet name which you can find in SEGW. The read operation works, see the part of response data below. But how does the read operation work under the hood? We can ensure that the response we see are fetched from the automatically generated database view when CDS view is activated, and we would like to know which exact line of code in ABAP does this job. As introduced in my blog Six kinds of debugging tips to find the source code where the message is raised we can get the answer via tcode ST05. Switch on SQL trace in your system via tcode ST05, and then perform the read operation again. Once finished, display the trace result with filter Object Name = “*03*0*”. ( Since at this time I am not sure whether data comes from Z20160309 or Z20160310 ). Only one result is found, and click the button to display ABAP code. Then we get what we look for. The line 22 does the read operation. This method CL_SQL_STATEMENT~EXECUTE_QUERY is quite useful and would be used in following chapters of this tutorial as well. Now we can study the callstack in the debugger to know how our request sent in UI is parsed and handled. It means I want only those records which fulfill the condition “Jerryid = LH” are returned. This time, the automatically generated SQL statement is a little bit different from the one for read operation. Here the “?” acts as a placeholder for parameter, whose value is specified by another variable in line 29. Once line 22 is executed, the filter operation works as expected. 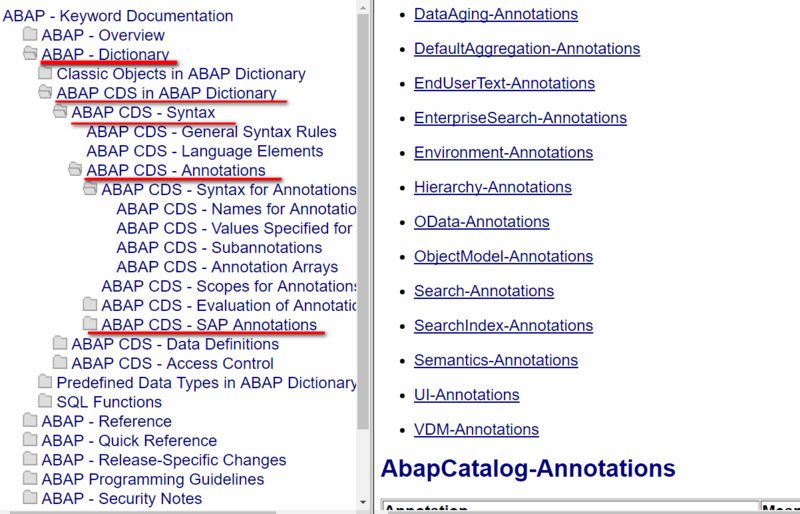 Open this url, and go to the list of SAP Annotations from the path displayed below. Which release did you use? BASIS 7.40 or 7.50? Have you already tried also CDS with “@OData.publish: true” annotation? Nice Blog Jerry.. Everything at one place about CDS . I want to know how to set break point in ADT when click the activate button. I try to set break point what you mention, but the debugging is not happen. Looks like this will not work with 7.4 BASIS. I don’t have the SEGW ‘Reference’ menu option. Perhaps something new in 7.5? probably you already found out on your own…. Nevertheless: You are correct, SEGW with RDS is available since NW7.50. In NW7.40 you can manually map your EntitySet to a CDS View on a field base. I’m new to CDS. I don’t know the exact difference between CDS view types. If you know any links to read about Basic, Composite, Consumption views & annotations can you share the links. I have added the url of SAP help into this blog. Please kindly have a look.